The FAA’s digital Terminal Procedure Publication (d-TPP) website application includes a “compare PDF” feature for civil Instrument Approach Procedures (IAP), Standard Terminal Arrivals (STAR), Departure Procedures (DP) and Airport Diagrams (APD) that have changed from the previous version. More details are in this safety alert (PDF) from 2010. It’s a handy feature that helps you quickly see what has changed when new plates are issued. Much confusion followed the last major update to 14 CFR Part 61 in 2009, especially the provisions in 61.57 that specify the requirements for maintaining IFR currency when using a flight training device (FTD) or simulator. On May 12, 2016, FAA published Regulatory Relief: Aviation Training Devices; Pilot Certification, Training, and Pilot Schools; and Other Provisions, which would update several regulations that apply to the use of aviation training devices (ATD). The proposed changes to the rules would allow instrument-rated pilots to log time in an ATD without having an instructor present. And the new regulations would allow instrument-rated pilots to use ATDs alone or in combination with time in an aircraft to maintain IFR currency. For more information, see FAA Proposes Significant Rule Changes here at BruceAir. 27. This revision of Sec. 61.51(g)(4) conforms the rule for logging of instrument time in a flight simulator, flight training device, and aviation training device to existing policy. This final rule amends Sec. 61.51(g)(4) to allow logging of instrument time in a flight simulator (FS), flight training device (FTD), or aviation training device (ATD) conforming to existing regulation or policy. An authorized instructor (See Sec. 61.1(b)(2)) must be present in the FS, FTD, or ATD when instrument training time is logged for training and aeronautical experience for meeting the requirements for a certificate, rating, or flight review (See Sec. 61.51(a)) [emphasis added]. The instructor must sign the person’s logbook verifying training time and session content. Examples of situations in which an authorized instructor will be considered present would be where an authorized instructor is seated at a center control panel in a flight simulation lab and is monitoring each student’s performance from control panel display. Another example would be a situation where an instructor assigns a student several instrument tasks and then leaves the room. In such cases, if the flight training device has a monitoring and tracking system that allows the authorized instructor to review the entire training session, the instructor need not be physically present. Another example would be a situation where one authorized instructor monitors several students simultaneously in the same room at a flight simulation lab. …Preambles to final rules serve two purposes; they explain the reasons for adopting the new rule, including responses to public comments, and they provide interpretive guidance on operation of the rule. However, when the rule and the preamble conflict, the rule controls. Accordingly, the regulatory text of §61.51(g)(4) is clear that in order to log the time an instructor must be present to observe an individual using a flight training device or flight simulator to maintain instrument recency experience [emphasis added]. We acknowledge that the preamble language indicates some intent to change the rule. For that reason, this issue has been forwarded to the Flight Standards Service. The final sentence seems to hold out some hope that FAA may reconsider its interpretation of the rules, but at present, the the letter seems to be official FAA policy on the matter. As noted above: The FAA is now proposing to amend § 61.51(g) by revising paragraph (g)(4) and adding a new paragraph (g)(5) to allow a pilot to accomplish instrument recency experience when using an FAA-approved FFS, FTD, or ATD—just as he or she might do when completing instrument recency experience in an aircraft—without an instructor present. Because instrument recency experience is not training, the FAA no longer believes it is necessary to have an instructor present when instrument recency experience is accomplished in an FSTD or ATD. An instrument-rated pilot has demonstrated proficiency during a practical test with an examiner. It can be expensive to hire an instructor to observe a pilot performing the instrument experience requirements solely to verify that the instrument recency experience was performed. I usually bring the Extra to Seattle in May for a full season of aerobatic rides and stall/spin/upset training. But the Pacific Northwest has endured a cool, cloudy, wet spring this year, and the skies are only slowly showing signs that summer may arrive for more than a couple of days at a time. So I delayed the trip this year. The trip, about 910 nm as flown, is always interesting. 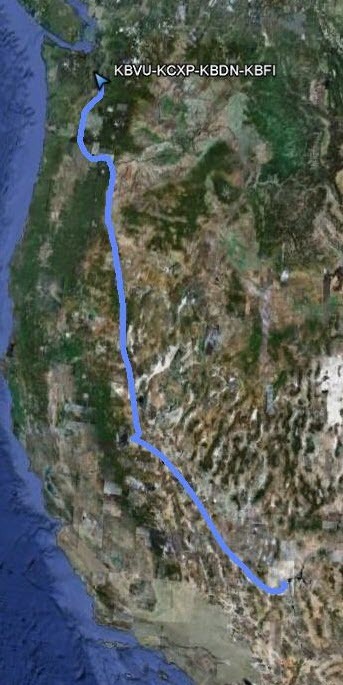 It begins over the moonscape that is the desert around Las Vegas, and the scenery gradually changes to include trees, dry-land farms, and finally the lush forests on the west side of the Cascades. Along the way, I pass over, beside, and between spectacular mountains and lakes (wet and dry). Here’s a photo album from a previous trip along the same general route in the Bonanza. Flying a long cross-country in the Extra is a challenge. It’s designed for high-performance aerobatics, not long cruises along highways in the sky (it’s also a great airplane for formation flying). You must hand-fly the entire time, compensating for the airplane’s inherent twitchiness; a virtue when looping and rolling, a challenge in all but the smoothest air. The cockpit is tight, leaving no room for arranging charts and amenities. The baggage area behind the pilot’s seat is compact. And there’s no heater, which, thankfully, isn’t usually a problem this time of year. The Extra is also limited to day/VFR flight—you can’t pop through cloud layers or stretch a flight into dusk. Finally, the airplane has a limited endurance, about two hours plus a reserve at normal cruise settings (which yield 160–165 KTAS). Tight cockpit of the Extra 300L. Flying cross-country in airplanes like the Extra is immeasurably easier these days, thanks to GPS navigators with moving maps and databases of information about airports and ATC frequencies. Datalink weather is also a huge help. I carry a Garmin GPSMap 396 with XM weather on such trips. Combined with information from the engine analyzer/fuel totalizer, the 396 makes it easy to monitor progress against the plan, keep tabs on the weather (especially surface winds) at the destination and alternates, and avoid the maze of MOAs and restricted areas that make flying portions of the route like running a gauntlet. Although the GPSMap 396 is now ancient (and discontinued) technology, it’s still an ideal device for an airplane like the Extra. There’s no place to mount a snazzy iPad to use with in-flight tool like WingX or Foreflight—a kneeboard also isn’t a good option; it interferes with the control stick. I plan my trips with Voyager, produced by Seattle Avionics. One of its best features is the ability to send a route directly to devices like the GPSMap 396, saving many button presses and typos. I also use DTC DUAT when checking weather and filing flight plans at FBOs (the other official DUAT provider is CTC DUATS). 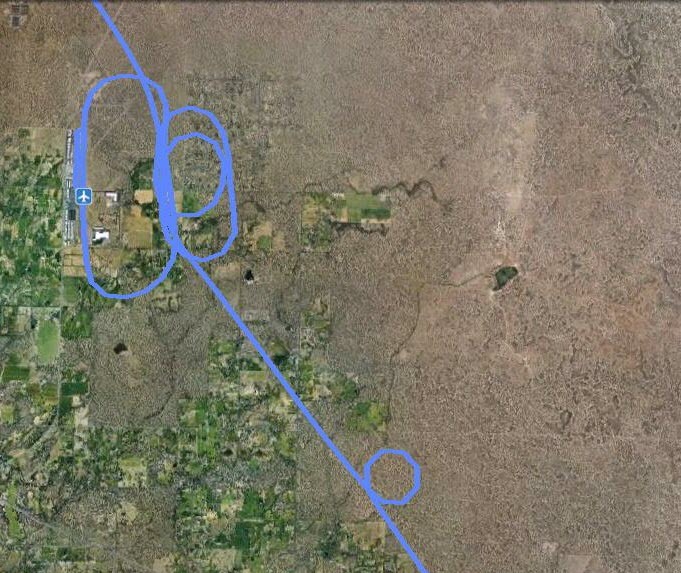 Sharp observers of the GPS track of the flight will note some unusual maneuvers as I approached Bend. As often seems to happen, a traffic-pattern flash mob formed during my arrival. Hoping to let the frenzy die down, I made one 360-turn while still several miles southeast. But with one airplane flying a pattern worthy of a 747, another dutifully following behind, and a helicopter swooping down to the only runway from the rotorcraft pattern on the west side of the airport, timing and spacing still didn’t work out. Minimum speed for the Extra in the traffic pattern is about 90 knots (any slower and the airplane flies in a high nose-up attitude, blocking the view and causing the stall horn to chirp), and flying an extended pattern with a long final approach can be awkward, what with the limited view over the nose. So, with no one behind me, I made a couple of additional circles before re-entering the downwind leg and landing. The other day, I was looking into an obscure issue related to instrument approach procedures, and my research led me to the Government / Industry Aeronautical Charting Forum. BACKGROUND/DISCUSSION: To meet needs for performance based navigation (PBN) and required navigation performance (RNP) for capacity, efficiency and safety area navigation (RNAV) is being implemented in the airspace of the United States. The FAA will transition to PBN based on area navigation RNAV everywhere and RNP where beneficial, enabled by Global Positioning System (GPS) as the primary means and DME/DME/IRU as an initial Alternate to ensure safety and continuous operations in the high altitudes and major terminal areas if GPS becomes unavailable. VOR service can not meet the needs for RNAV and PBN in most situations. Therefore, the FAA is beginning to discontinue VOR service from facilities in CONUS and intends to have a minimum network in place in 2020. This discontinuation of VOR service will affect approximately half of all VORs in CONUS. Remaining facilities will be used for terminal and enroute functions and reviewed for discontinuation at a later date to move to a totally RNAV airspace system. Existing Victor Airways and Jet Routes will be replaced by T routes (low altitude) and Q routes (high altitude) and terminal and approach procedures will be RNAV based. 1. The proposed rulemaking action with associated collection and response to comments is sufficient for this discontinuation of service. No formal rulemaking action will be needed for the discontinuation of service from each VOR facility, each airway or airway segment or for each procedure. These will be handled through the informal process used for Part 71 and Part 73 or the non-rulemaking circularization for technical changes in accordance with JO 7400.2H (PDF). a. Should VORs be discontinued to remove whole Jet routes /Victor airways or should individual facilities be removed that will allow the airways to continue as is, possibly with minor rerouting? If airways are to be kept as long as possible what would the impact be on airspace design/redesign and charting? b. Should Q and T routes be designed and implemented to replace Jet routes/ Victor airways before the VORs describing those routes are discontinued? Should the Q or T route replacing the Jet or Victor be overlayed on those airways/routes and as the VOR service is discontinued the route turns into a Q or T route? c. When VORs are discontinued such that Victor airways or Jet routes can not be maintained should aircraft not capable of RNAV operation be cleared directly from one VOR to another? d. For discontinuing VORs supporting terminal procedures (SIDs, STARs, SIAPs) what should the priority order be? Should service be discontinued such that arrivals, departures and approaches are maintained for each direction though not on all runways, then one direction removed and eventually all removed leaving only RNAV based procedures? As you can see, at this point there are no specifics about which VORs will be turned off and on what schedule. That information is supposed to be in the Federal Radionavigation Plan, updated every two years (the 2010 edition is here [PDF]). The FAA is clearly thinking about the issues involved and soliciting comments from the aviation community, but the agency still hasn’t released a detailed list of navaids that it plans to shut down. Pilots often debate the value of adding an IFR-approved GPS to the avionics stack in their aircraft. Most of the arguments focus on the value of WAAS-capable units, which can be used as a primary means of navigation (see AIM 1-1-20) and allow you to fly Approaches with Vertical Guidance (APV), including procedures with LPV and LNAV/VNAV minimums. If the airports you use frequently have ILS procedures, the GPS skeptics assert, you really don’t need a WAAS-capable GPS box. Fly T-Routes, which will replace Victor airways as VORs are decommissioned, and which often offer lower MEAs that are often helpful when icing is forecast or reported. (For more information on decommissioning VORs and replacing Victor airways with T-Routes, see “Discontinuation of VOR Service and Associated Airways” in the minutes of the April 27-28, 2011 meeting of the Government / Industry Aeronautical Charting Forum [PDF]). Fly airways without hassle even when one of the navaids is OTS (as happened to me recently on a flight from the Southwest back to Seattle–the OED VOR went down while I was en route). Get GPSS steering on your autopilot. Eliminate the need for DME and ADF. File alternates that offer only GPS-based approaches. With suitable hardware, get real-time information about your fuel state without having to do calculations. View your position on a moving map, which greatly aids SA, especially when operating IFR as a single pilot. Fly RNAV SIDs from increasing numbers of small airports (e.g.,KTDO [PDF]), again increasing SA during a critical phase of flight and making departures easier to fly. Fly SIDs based on conventional navaids much more easily (e.g., the BRUTE 5 [PDF] procedure at KMFR and the NORTHTOWN TWO [PDF] SID at KVGT). Improve the accuracy and ease of descent planning with V-nav features. Can you accomplish the above without GPS? Yes, mostly. But there’s real value in the additional capabilities that an IFR GPS brings, especially if you fly IFR single-pilot. Anything we can do to reduce mundane workload so that we can devote more brain cycles to SA and ADM makes flying safer. Today, most instrument-rated pilots are familiar with and using RNAV (GPS) approaches. (As of March 2013, some 12,675 RNAV procedures are in the U.S. inventory, and the FAA is publishing many new GPS-based procedures at each update cycle.) The majority of RNAV approaches resemble procedures based on ground-based navigation aids, such as VORs and ILSs. They include charted feeder routes from airways or fixes, each with clearly labeled courses and minimum altitudes to fly, that lead to the final approach segment (see Figure 1). Figure 1: The plan view of the RNAV (GPS) RWY 24 approach (PDF) at Hoquiam, WA (KHQM). Some RNAV approaches depend on a different method of handling the transition from the en route environment to the approach, and that system, called Terminal Arrival Areas (TAA), confuses many pilots. On a chart, TAA look like pieces of pie (see Figure 2). The plan view of the RNAV (GPS) RWY 13 approach (PDF) at Tillamook, OR (KTMK), with TAA highlighted. Instrument Procedures Handbook (PDF), p. 5-45 and p. 4-9. In other words, TAA effectively replace feeder routes, and they enable ATC to issue succinct, efficient clearances to RNAV-capable aircraft flying along an airway that passes over or near an airport or proceeding direct toward an airport from any direction. Using TAA eliminates the need for a series of vectors, which also makes them useful in areas where ATC may have poor radar coverage at the altitudes typically needed to guide airplanes onto feeder routes or the final approach course. To learn more details about TAA, you can read the references cited above. The big issue for pilots cleared to fly an approach via a TAA is how to interpret ATC clearances—in particular, when and how low to descend during the initial stages of the approach. Pilots entering the TAA and cleared by air traffic control, are expected to proceed directly to the IAF associated with that area of the TAA at the altitude depicted, unless otherwise cleared by air traffic control. Clear[ance] direct to an Initial Approach Fix (IAF) without a clearance for the procedure does not authorize a pilot to descend to a lower TAA altitude. If a pilot desires a lower altitude without an approach clearance, request the lower TAA altitude. If a pilot is not sure of what they are authorized or expected to do by air traffic, they should ask air traffic or request a specific clearance. “N1234A, 15 miles from EYCEH, cleared RNAV runway one-three approach. “N1234A, 15 miles from JEQEF, cleared RNAV runway one-three approach. According to Section 8 of Air Traffic Control, the ATC handbook, an aircraft inside a TAA is established on a published segment of an approach and can be cleared using procedures and phraseology similar to those given to an airplane being vectored to join a feeder route or other segment of an approach. If the airplane is NW of and within 30 nm of FETUJ, descend and maintain 4500 until reaching FETUJ. No procedure turn is required or allowed when arriving via the NW segment of the TAA; a PT is required when arriving in the NE segment of the TAA, where the charted altitude is 5500 until reaching FETUJ. If the airplane is SW of and within 30 nm of EYCEH, descend and maintain 5400 until reaching EYCEH, and then fly the published route and altitude (046° at 4500) from EYCEH to FETJU. If the airplane is SE of and within 30 nm of JEQEF, descend and maintain 5900 until reaching JEQEF, and then fly the published route and altitude (226° at 4500) from JEQEF to FETJU. Unless otherwise cleared by ATC, you are expected to fly the charted altitudes when you are inside a segment of the TAA and cleared both to an IAF and for the approach. If you are cleared to an IAF, but not yet cleared for the approach, you are not automatically cleared to descend to a TAA altitude. Fly your last assigned altitude. If you have any question about the altitude you should fly, ask ATC. 3. The MVA/MIA may be lower than the TAA minimum altitude. If ATC has assigned an altitude to an aircraft that is below the TAA minimum altitude, the aircraft will either be assigned an altitude to maintain until established on a segment of a published route or instrument approach procedure, or climbed to the TAA altitude. Pilots on some aviation forums have reported that ATC is also still learning how to handle clearances that include TAA, so that last point is especially important. As always, if you have any doubt about the meaning or intent of an ATC clearance, ask for clarification immediately.